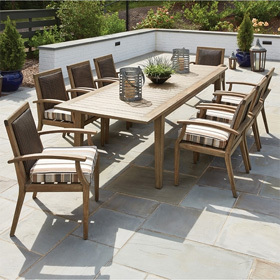 Entertain in style with this OW Lee Gios patio bar set that includes 4 swivel bar stools and 42" square bar table. The Gios collection from OW Lee features an extruded aluminum modern style frame that will impress the most discerning customers. Modern style with swivel slat back bar stools. Made in the USA from durable extruded aluminum. Custom order seat cushion fabrics. Lifestyle photo shown with Graphite frame color, Momentum Bronze (OD91) cushion fabric, and Urban Tempo tile table top color. Bar Stool 26.25"W x 26.25"D x 48"H 50 lbs. Table 42"L x 42"W x 42"H 96 lbs.